We are always excited about the next kitchen project. It’s the gathering point of every home, and is a combination of function, layout and flow. Once these items are in place, the creativity begins. Focal points are created with the use of tile, lighting, appliances and cabinetry. The detail is critical from start to finish, with the end result exuding comfort and inviting conversation. Corian surfaces combined with a bamboo 2 level surface area, textured glass in maple cabinets and “theatre style” track lights are a perfect solution for this unique home with an original V- groove ceiling. The kitchen was opened up with rear wall removal. The family room is part of the addition area. 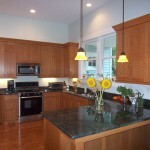 Cabinets are maple, surfaces of soapstone, and flooring hardwood. 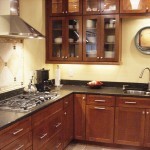 An island of concrete with slate inlay picks up color from the granite surfaces on the surrounding cabinets. Antique white cabinets with a coffee glaze blend with stained cabinets, and side by side ovens give an eclectic, yet warm feeling to this kitchen. This kitchen functions non-stop, and the central cook-top invites conversation. 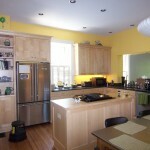 This new kitchen resides in an early 1900s home. The attention to detail in the windows, trim, and wood flooring maintain the historical integrity of this home. 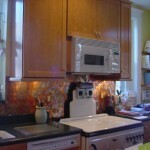 Incorporating earth tones, and copper colors in the backsplash of the cooktop, a focal point was created. The surfaces are Silestone, and cabinet hardware picks up on the style of appliance pulls. 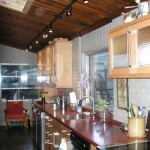 For this complete remodel, a wall was removed to open the dining and eating areas. 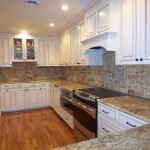 The remodel included new tile, custom cabinets, lighting, and hardwood flooring. Now this condo sports a kitchen with flair, providing comfort for family gatherings, grandchildren visits, and quiet time at home.